There is nothing like a nice cool breeze to bring the temperature down on a warm day. But there is one thing I just can’t stand, extreme windy conditions, especially hot conditions! Like nearly being blown away wasn’t enough the wind has got to be hot too? So today I am going to tell you all about the best umbrella for wind. I know you are probably thinking – this is a sun safety blog right? Well yes! And umbrellas are a great sun protection tool! Your own personal piece of shade that you literally can carry wherever you go. But what good is a sun safe umbrella if it doesn’t hold up to strong winds? 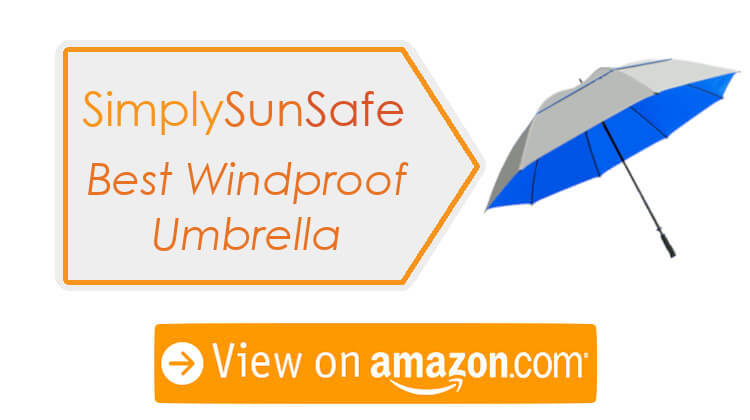 After thorough research into requirements for umbrellas to be effective when used in windy conditions, SimplySunSafe recommends SunTek 68″ UV Protection Wind Cheater Vented Canopy Umbrella as the best umbrella for tackling the win. Read on for a detailed buyer’s guide, comparison table, and in-depth reviews of the top 5 umbrellas for heading out into the wind. So you are bracing yourself for windy conditions and want to avoid your umbrella falling apart or flying inside out. The best windproof umbrella is going to have some specific features you will want to look for. See below for my recommendations. Windproof umbrellas come in all sizes so you need to think about what you plan on using it for. NEed an umbrella just for you or to share? What about the activity you’ll need it for, like golfing or hiking? You won’t want to take a big umbrella on your hike or if it’s just to protect you. But for golf or protecting more than one person, a large umbrella might be more appropriate. Decide on your use first and that will determine your size. Umbrella sizes are not measured how you think they are, or at least how I thought they were! Umbrellas are measured around the curve rather than straight across the width so you will want to make sure you are looking at the correct measurements. Smaller umbrellas for yourself will be somewhere in the range of 35 to 50 inches. This will provide you enough protection to cast some personal shade and isn’t too big that you need to clear space around you when opening. Large umbrellas can reach up to 68 inches in size which can fit 2-3 people… group hug anyone? With a windproof umbrella you want it to be heavy enough to stand up to tough windy conditions but not too heavy that it’s a hassle to carry around. A heavier umbrella will most likely be a stronger umbrella but make sure you are comparing umbrellas of the same size when comparing weights. It sounds a big strange to have ventilation as something you would look for in an umbrella right? Well some smart companies now manufacture umbrellas with ventilated areas that allow wind to pass ‘through’ the umbrella, making it more resistant to windy conditions. But don’t worry, these vents don’t let sun or rain through so you’ll still get the protection you need with the added bonus of extra wind resistance. Now this one does not assist with windy conditions but it important for protecting you from the sun. UPF stands for Ultraviolet Protection Factor. This number gives you a tool to understand how much ultraviolet rays may reach your skin and cause sun damage. I only feature products with excellent protection. That is, materials with a UPF of 40 or more. This ensure you’re getting the best sun protection with any of my recommendations. For an umbrella to stand up against the wind it’s going to want to be pretty strong and durable. There are lots of options when it comes to umbrella materials. I have listed some below which you should keep an eye out for when making your purchase. Fibreglass – a super tough option for standing up to windy conditions. It’s also safe to use in storms. Polyester – perfect for protection you from rain and sun. This may come as a shock but not all umbrellas are built for both rain and sun! All of the umbrellas I will look at today do both, but If you are after an umbrella dedicated to sun use it could be different to an umbrella you want to use in the rain. How do you want to get your umbrella opened and looking after your skin? This may be a selling point for you or you may not have even thought about it! 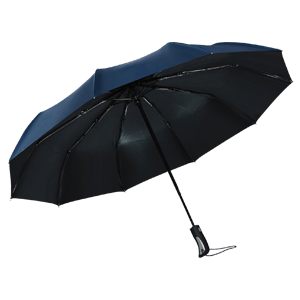 Umbrellas come as automatic opening which open (and perhaps close) with one press of a button. Others will require you to manually push them open and close yourself. Umbrellas come in all different types of quality, colors and sizes which means they are also all different prices! Depending on what you are after umbrellas can range anywhere from some under $20 to into the hundreds. 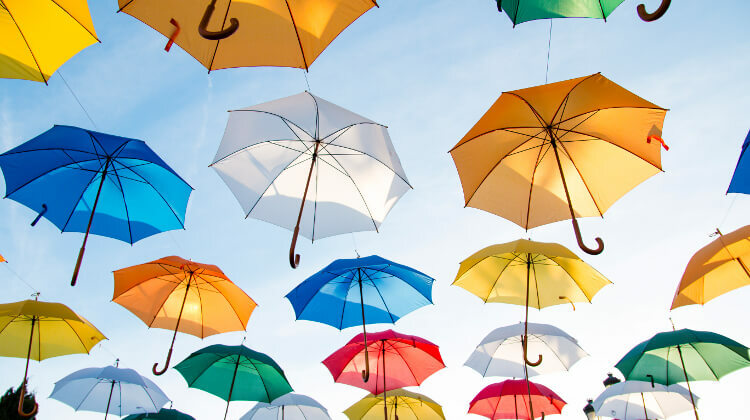 After thorough research that combined discussing issues with customers, reviewing customer feedback, examining manufacturer specifications, and participating in forums, SimplySunSafe has chosen the 5 best umbrellas for windy conditions. All of these have the features we looked at in the buyers guide including great UPF ratings, wind resistance design, a range of sizes and weights, and a large range of materials and colors. 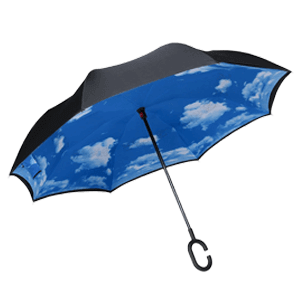 The SunTek UV Protection Wind Cheater is a great option for those on the hunt for a large windproof umbrella. SunTek have designed this umbrella as the only one you’ll ever need. It’s a huge 68 inches which is big enough to fit two people comfortably, 3 people if you really like them. 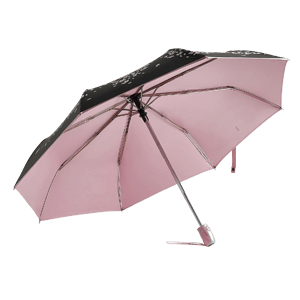 The shaft and ribs are made from high quality fibreglass resulting in a super sturdy and thunderstorm safe umbrella. The Wind Cheater umbrella canopy is 100% nylon and has a UPF rating of 50 giving you the best sun protection available. Built with sun protection in mind the external color has a silver coating to reflect away UV rays to help keep you cool. The Wind Cheater gets its name from the innovative vortec venting system which features a double canopy that helps to prevent the umbrella from inverting during high winds. A universal ergonomic handle will fit in most golf carts and will make both left and right handers happy. The Wind Cheater umbrella is available in 4 different internal colors depending on your taste. Each umbrella also comes with a matching cover for protection. It’s a mid-range budget option that will suit everybody. Get SunTek UV Protection Umbrella Now! The Joyaki is a compact windproof option for those of you looking for something a bit more portable. Featuring a 42 inch canopy it is a mid-size travel umbrella that folds down to a small 13 inches. The canopy is rated a great UPF 50 so you are well-protected from the sun. This umbrella is crafted from premium fibreglass and high quality stainless steel. The frame has 10 ribs for superior strength against windy conditions. Opening and closing is a breeze, especially if you have your hands full, with the automatic button function. An ergonomically designed slip proof handle puts comfort and safety first, there is also an elastic loop so it won’t be blown away. The Joyaki is also abrasion, mold and mildew resistant so you don’t need to worry about leaving it out to dry before packing it away. Color options are limited with a dark blue or black option. The Joyaki is a steal though and comes in as a low budget option. Get JOYAKI Compact Umbrella Now! The G4Free Double Canopy Umbrella is a great options for those looking for more coverage during sunny and windy conditions. It is the ultimate golf umbrella with a large canopy and a durable sturdy design which is sure to stand up against tough weather conditions. The frame is crafted from stainless steel coated in high-grade resin, the ribs are made from fibreglass which is a more flexible but still durable option. The UPF 50 rated double canopy creates a vent allowing wind to pass through. All of these features make this G4Free umbrella virtually windproof. The G4Free uses an automatic opening mechanism, great for those of us with only one spare hand never a second to spare. Even though this umbrella is built tough it is still lightweight and alose mold resistant. Two different size options of 62 inch or a massive 68 inch will give you the ultimate coverage. Each size also has a number of color options too so there’s bound to be one that suits your taste. A great mid range budget option. Get G4Free Vented Umbrella Now! This umbrella just keeps popping up in my lists. Since first reviewing these I have seen them everywhere. I am going to assume you have not seen these before and give you the entire breakdown on why this is a fabulous purchase. The BAGAIL inverted umbrella is an innovative design to make your life easier. Covering you in all weather conditions, sunny, windy or wet, its canopy features a UPF rating of 50 so a majority of the sun’s ultraviolet rays won’t reach your skin. The inverted design means this umbrella folds upwards so no more drips and… getting in and out of the car is a lot less awkward! A smartly design handle gives this umbrella a hands free usage. Ideal for those who are constantly on their phones or busy mums and dads who need their hands free. At just over 42 inches, this umbrella is ideal for one person, 2 if you are really friendly. 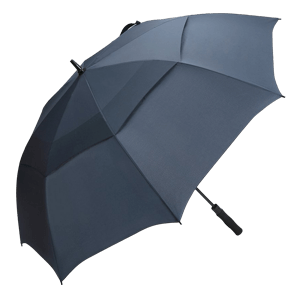 A carbon fibre shaft and ribs give this umbrella a wind resistance and also prevents rusting. Now for the fun stuff, there is a huge number of colors and patterns to choose from. Everything from clouds to sunflowers and solids colors are available. A mid range budget option that is perfect for you if you are after something that has just enough coverage for one person and is a little different. 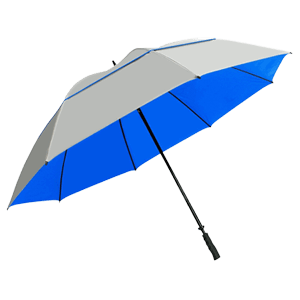 Get BAGAIL Inverted Umbrella Now! Lucky last, but by no means the least, another compact travel windproof option. The Renzer travel umbrella might be small on size but it isn’t small on features. A 100% polyester canopy with a rating of UPF 50 has you covered through all weather conditions. When opened the arc measures approximately 43 inches and the whole umbrella closes down to 11 inches and weighs just 13 ounces! To ensure you are guaranteed protection from the elements there are two canopies. The 8 ribs and shaft are made from strong and sturdy fibreglass to assist in strong winds or storms. Getting it open and closed is a breeze with an automatic button feature, one press and up it goes. An anti-slip rubberized handle helps reduce hand and wrist soreness. The outer layer features a black background with a unique design of cherry blossoms while the inner layer is available in 4 different different colors. A low budget option for anyone looking for s tough travel umbrella. Get RENZER Windproof Umbrella Now! If you are headed out into some windy conditions – I wrote this article for you! There is no need to sacrifice using an umbrella as sun protection because you think you may get blown away. Look for sturdy strong options that have incorporated features to assist with creating a wind resistant umbrella. Today we looked at both large and small options so there is bound to be one that suits your needs. Keep in mind the buyers guide features we looked at to see what you should look for when making your purchase. SimplySunSafe recommends the SunTek 68″ UV Protection Wind Cheater Vented Canopy Umbrella as the best windproof umbrella. After taking into consideration all the features in the buyers guide, this was the product that came out on top. If one of the other four better suits your needs, go ahead and choose that one because ultimately the decision is about you and your needs. Drop a comment below if you end up making a purchase or find another umbrella that suited you better. Researching is one of my favorite things to do and i might even update my guide.